Optimization of the keel and the rudders is laborious work and requires a lot of patience. When done by yourself, your lower back and arms will suffer a lot, because you can’t comfortably reach the keel and rudder. Nevertheless, it is worth the effort to invest in them. 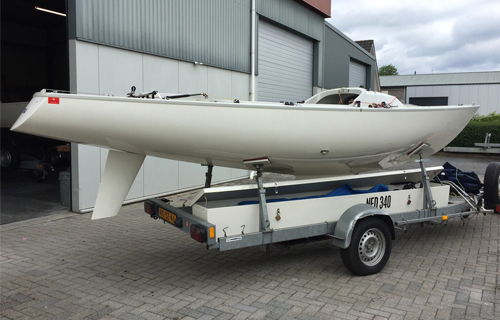 Definitely the keel is essential for optimal performance: If you don’t have a neat and well profiled keel, you won’t be able to perform optimally. The optimizing of the keel is a particular critical and difficult job. 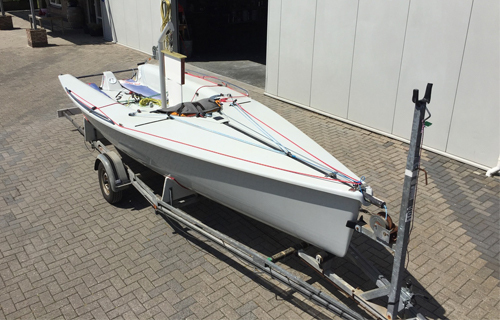 Optimal performance, either up wind and downwind, require your keel to have an efficient profile that precisely suffices the minimal thickness and maximum draft allowed by the rules. To obtain the desired profile, we use templates and models from the organization of the sailing classes. Before commencing with the fairing and shaping, we first get rid of all the old paint. We apply the first layer of putty with brushes, this does not only fix any damage, but also optimizes the profile. As soon as the finest profile is obtained, the keel gets polished with epoxy and the varnish is applied. The result: A properly profiled keel that meets the official requirements.